Well since I ran out of pancakes, I just ate a banana and a hard boiled egg with my coconut milk coffee drink. Following the Whole 30 to a tee is proving to be more of a challenge than I thought. I will try and post recipes that follow a Whole 30 plan, but with my current life style, it’s almost impossible to follow so strictly without going insane. And if one day goes particularly badly, I won’t count it and I will set myself back one day. Not the “Whole 30” intention, but hopefully one day I will be able to stick to it! I do like how I feel eating healthy foods, but the preparation involved is causing my time to be a bit constrained! Anyhow, for lunch I was able to make some more of the Chicken Lo Mein (with cabbage as the noodles) and relax and eat it, which was nice. I really like the weekends :). For dinner, I made this really cool dish and semi-invented a new recipe! I was pretty happy with myself. Doubly so, because Quint really seemed to like them as well. 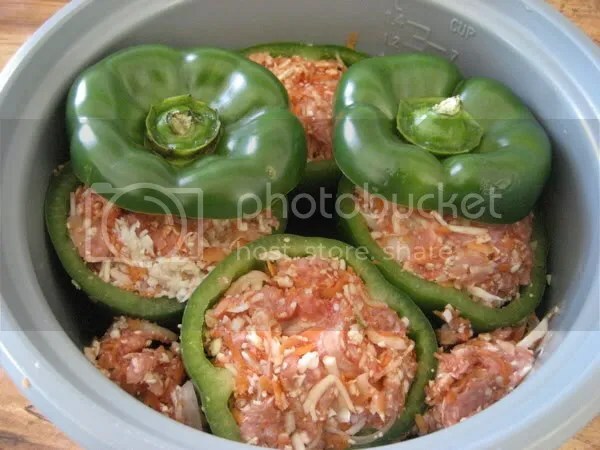 I had some leftover green peppers I bought at the farmers marker, so I set out to loosely follow the recipe for the Crock Pot Stuffed Green Peppers from the website, Mark’s Daily Apple. I had 1.5 lbs lean ground beef so I mixed that with the pulsed veggie mixture: raw cauliflower (1/2 a head), carrots (2), huge onion (1/2), garlic cloves (2) and a bit of salt and pepper. 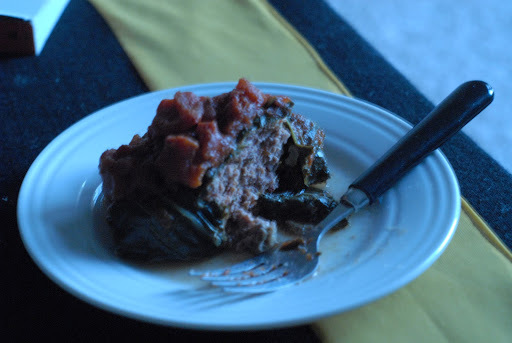 I stuffed my peppers with this concoction, but had quite a bit left over. 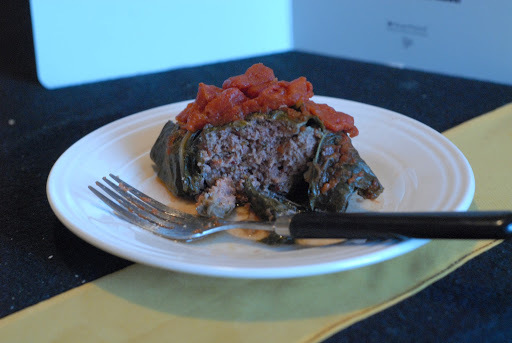 So I took my boiled collard greens and rolled them into mini burritos. 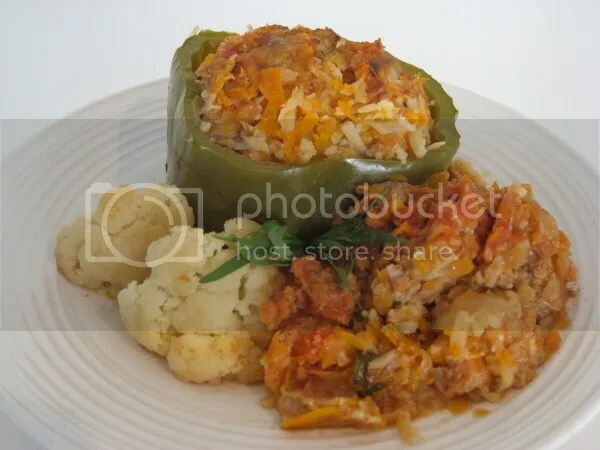 I then thought it would be a good idea to saute some onions in a bit of olive oil, place the “burritos” and stuffed peppers in that dutch oven and cover them with a large can of oranic diced tomatoes. I baked it at 300* for about 3 and a half hours. The results were pretty delish! 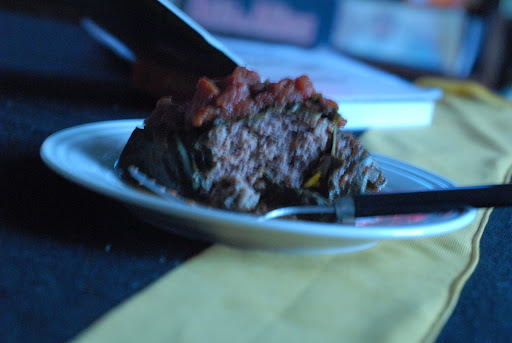 It had a kind of stewing effect and made the collard greens really soft and gave the meat inside a meatball like texture. It was very dense without feeling heavy if that makes any sense?